Between MLM Businesses and Pyramid Schemes... Now that's a hot topic! Have you ever mentioned that you were thinking about starting a business that's based on multi-level marketing and watched your loved ones run in circles screaming, "No! Don't do it! It's a pyramid scheme!"? based business they dream of. 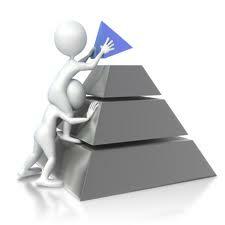 Pyramid schemes and multi-level marketing have very similar structures and are often confused. Rest assured though, most multi-level marketing businesses are not scams. They are completely legal and even regulated by the Direct Sales Association (DSA). 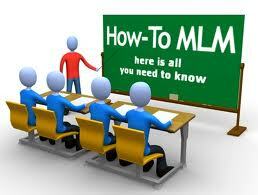 MLM stands for multi-level marketing and is also commonly known as direct sales or network marketing. The idea that drives a multi-level marketing business is people helping other people succeed. While all companies have different products and compensation plans, the structure is the same. In a multi-level marketing business you usually pay a minimal start up fee. This fee buys your business kit. Sometimes people run away as soon as you mention buying the start up kit. After all, they have heard many times that you should never have to pay for a work at home job. This isn't a job though; it's a business, and businesses require start up costs. In fact, purchasing a business kit is one of the great things about MLM businesses. Compared to start up fees you would normally shell out for a business, the business start up kits for MLM businesses require a nominal investment. One of the traits of a pyramid scheme is a high start up cost. This may also be in disguise of a business kit, however, the amount of inventory that this high start up cost is buying you will be unreal. A legitimate direct sales company will usually have a minimal start up cost that doesn't require you to purchase a lot of inventory that will be impossible for you to sell. After you purchase your start up kit, you can sell both the products and the business opportunity. When you sell the business opportunity, you get paid for the sales that people in your downline make. This can create a nice passive income for you, but it's also why people confuse network marketing with pyramid schemes. Legitimate direct sales companies sell any product you could possibly imagine. You can choose to sell insurance, children's toy, and even craft supplies. You name it and there are MLM businesses designed around it. Network marketing is a great way to earn a lucrative income from home. There are countless legitimate companies out there that give you the opportunity to succeed. As long as you remember to watch out for the high start up costs, unrealistic inventory amounts, and check out the business that interests you through the direct sales association you are not likely to fall victim to any scams. 0 Response to "Between MLM Businesses and Pyramid Schemes: How to Tell the Difference"